Jun. 7, 2012 3:00 p.m. When Canadian frigate HMCS Regina heads for the Arabian Sea in July, it will make history when it deploys with a covert unmanned aerial drone. 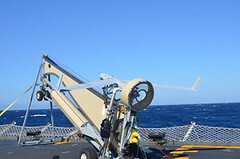 The ship will carry a ScanEagle remote-controlled vehicle – essentially a tiny airplane that can fly for more than 24 hours – that can capture high-quality images and data used for intelligence-gathering, surveillance and reconnaissance. “This is something of a first for a West Coast ship,” said Cmdr. Jason Boyd, who took command of Regina on May 18. The aerial vehicle, built by Boeing company Insitu Inc., will likely prove useful when the ship conducts patrols as part of an American-led naval counterterrorism operation now underway in the Gulf of Aden, Gulf of Oman, Arabian Sea and Indian Ocean. International waters in the Middle East span 2.5 million square miles. The crew’s job during the seven-to-eight-month mission, he said, will be to look for suspicious ships, take note of traffic patterns and act as a deterrence in an unstable region. When Regina leaves CFB Esquimalt, it will carry 260 crew members, including Sea King maritime helicopter personnel. The ScanEagle team onboard will include civilian experts from New Brunswick-based ING Engineering, which is supplying the unmanned unmanned drone. The frigate is replacing HMCS Charlottetown, an East Coast frigate that left for the Mediterranean Sea in January. Charlottetown‘s mission changed May 3 when it was ordered to the Arabian Sea, where some of the most important shipping lanes in the world are said to be situated. An unmanned aerial vehicle stationed on the vessel has been credited for playing a critical role in spotting vessels involved in running drugs. The same technology was used by the Canadian military in Afghanistan. Regina’s crew is eager to begin their mission, though there is still some training to do in the coming weeks with the Sea King team, and testing of ship systems, following a recent six-week maintenance period. The upcoming mission is seen as a plum assignment by those on board, he added. Boyd is also looking forward to putting his 19 years of Canadian naval experience to the test.